Goldberg's Depression Test was developed by Dr. Ivan K. Goldberg of New York, a world renowned Psychiatrist who specialized in psycho-pharmacology and depression. Goldberg's Depression Test is a simple, self-administered test that you can use to assess your risk factor for depression and if you should seek professional medical treatment. Dr. Ivan K. Goldberg attended Johns Hopkins University and New York University College of Medicine.He was founder of PsyCom.net in 1986, and a psychiatrist and a clinical psychopharmacologist in private practice in New York City.Dr. 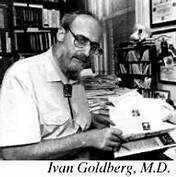 Goldberg also served on the staff of the National Institute of Mental Health and the Departments of Psychiatry of the Columbia-Presbyterian Medical Center, and Columbia University’s College of Physicians and Surgeons.In short, Dr. Ivan Goldberg was a treasure house of information and practical knowledge in the field of mental health and depression.Goldberg's depression test is a series of 18 questions to help you gauge your depression risk factor.If you find that you might be experiencing depression, please seek out professional medical help. which is a treasure trove of information which exists as the amazing legacy of Dr. Ivan Goldberg. Goldberg's depression test is just 18 questions, but psycom.net has over 30 years of mental health advocacy and a host of articles geared to steer a person suffering with depression in the right direction. When answering the following questions think back over the last two weeks and assess your feelings during this time frame. Decide to which extent the individual statements apply to how you’re feeling. While we are all grateful that Dr. Ivan created Goldberg's depression test, it is important to remember that Goldberg's depression test is a tool for self-assessment. Goldberg's depression test is not a diagnosis of depression. You need to see a doctor face to face for a diagnosis of depression or any other illness. If you suspect you suffer from depression, please contact your doctor immediately. Check out the following infographic on depression and you can see why Goldberg's depression test is so critical. Depression is a worldwide epidemic and the illnesses and diseases related to depression make it urgent to treat depression as soon as possible. Goldberg's depression test will begin below after the Infographic. Another useful test mostly used by professionals is the medical mnemonic sigecaps depression which you can read about over here. There are 18 questions on Goldberg's Depression Test. For each question, take a moment and note if you have been feeling this symptom at all and if yes, to what extent over the last two weeks. If you do not have the symptom at all, then make no selection and your score for this question will be 0.